In “Water By The Spoonful,” characters in the internet chat room stand on separate platforms to represent their physical separation. The play, which deals with issues of drug addiction and death through this chat room setting and through a Puerto Rican-American family, opens Friday in McCormick Auditorium. Playwright Quiara Alegría Hudes’ play, “Water By The Spoonful,” deals with the topics of drug abuse and death through two interwoven perspectives: an online chat room for recovering crack addicts and the life of a Puerto Rican-American family. The play was chosen for Spectrum Theatre Company’s “unheard voices” slot, which presents stories that are often overlooked in a theater world dominated by heteronormative, cisgendered, white, male narratives, said director Morgan Rielly, a Communication sophomore. In the 21st century, where the internet has become a primary form of communication, “Water By The Spoonful” shows how people find intimacy and support in a virtual world. Producer Jonathan Gelb said “Water By The Spoonful” was selected for the Latinx voice it will bring to campus and for its complex narrative about drug abuse, a subject often oversimplified in the media. The lead character is Odessa, a former drug addict and creator of an online chat room for recovering addicts to seek support. Rielly was immediately drawn to the character due to the beauty of her compassion and selflessness, she said. 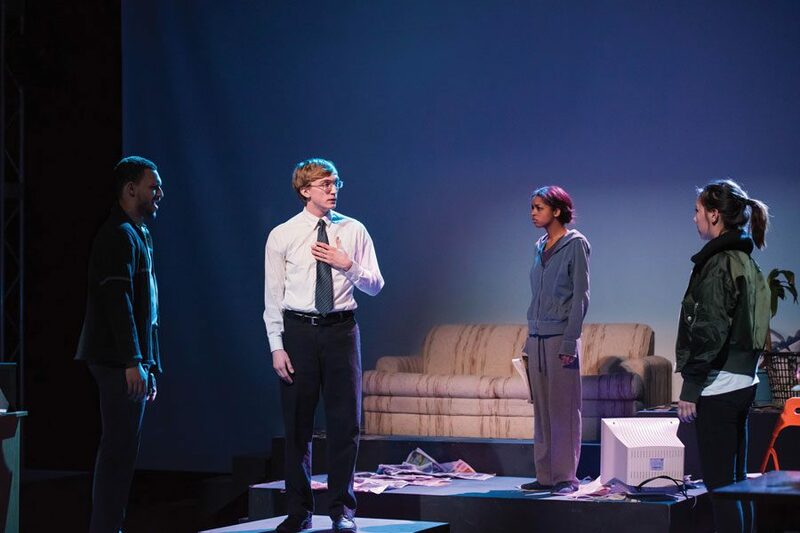 Communication sophomore Ziare Paul-Emile, who plays Odessa, said the insufficiencies of relationships sustained through social media will be a familiar topic for Northwestern students in the audience. Though online-only connections can be comforting, people can relate to the desire to have more than what one finds on the screen, she said. In spite of its heavy subject matter, the show doesn’t indulge in many dark moments, and characters even manage to maintain funny rapport, Gelb said. “Even though it’s confronting a bunch of issues, it doesn’t over-dramatize them,” Gelb said. The show’s set design and blocking combine to convey the separation of characters in the chat rooms. Even when they are engaging in dialogue on stage, they must stand on wooden platforms, they cannot touch each other and they can only move to another platform if characters are having an intimate emotional connection, Gelb said. Rielly added that the play’s themes of connection and empathy spoke to her as an artist.